« “Selene” Is a Featured Read at The Fussy Librarian! 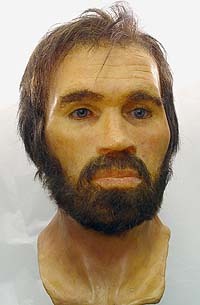 Reconstruction of the “Lindow Man” bog body. Courtesy of Wikipedia. Samhain–the night of the dead. Yevetha knew from the ice around her heart there was one more ghost to walk the night and haunt her dreams. She clutched a tiny fur blanket to her sunken chest and rocked back and forth, keening. Sixteen summers ago she had ripped a bloody baby from the womb of her dying daughter and had wrapped him in the fur. Yevetha had searched in the bogs for the rare herbs that would bring on her milk and had endured the pain caused to an aging body as it prepared to nurse the tiny infant. Her love had been rewarded as Bohumil grew into a fine strong young man with his mother’s blue eyes. At the waning of the last full moon, Bohumil had come of an age to marry. He had packed for the hand of days it would take him to travel to the ocean tribes and set out through the forest to trade for a bride price. The full moon returned. Bohumil did not. Yevetha pulled her worn skin cloak tighter about her shoulders and turned to the fire pit at the back of the hut. The cramped space reeked of peat smoke and the herbs drying in the thatch ceiling. She pushed at a tangle of coarse gray hair, leaving a smudge of soot across one cheek. Yevetha had seen forty-six winters. She was weary and there was no one to replace her as healer now that the Sun priests had outlawed the worship of the Great Mother and all Her arts. She spat on the fire. For twenty years the Sun priests had cursed her life. They had converted the village men to their Sun worship and fewer and fewer women met in the secret glade to keep the covenant with the Mother Goddess. Yevetha pulled a bronze knife from her belt and stretched to cut several herbs from the store in the ceiling. Bitter rue for grief, sweet rosemary for remembrance and rough hemp for dreams. She took a figure made of twigs from a plain reed basket and tied the tear-stained fur around its waist with a twist of straw. A smile softened her face as Yevetha tested the sharpness of the knife on the callused skin of her left thumb. The knife had belonged to her dead mate, Berk. He had been the man the Great Mother created just for her. His fire had warmed the chilly corners of her soul; his laughter rescued her from the seriousness of her duties to the sick. Her daughter, her husband and now, she feared, her grandson had left her behind. Yevetha prayed but the Great Mother gave her no sign that Bohumil was alive. She prepared to search for him among the dead. Her eyes narrowed to glittering slits as she slashed her thumb, squeezing the drops of blood onto the carefully prepared herbs. Yevetha settled to her knees with a hiss of pain, laid the figure next to the fire and chanted a prayer to the Horned One, God of the Dead. She sprinkled the figure with the blood and herbs, kissed it, and threw it into the flames. The fire flared, sending her gasping back onto her heels. It quickly burned low, settling into a mesmerizing pattern of red and black coals with an occasional glitter of gold fire. Yevetha inhaled the sweet smoke as it drifted toward the ceiling. The wind that had been rustling the trees sighed to a whisper. A voice moaned outside her door. Yevetha slumped as she listened then straightened her shoulders. Hesitating a few minutes, she picked up her digging stick, tied her medicine pouch onto her belt, and moved into the night haunted by her fears and memories. So many dead to haunt this night. The bloated moon was caught in the upper branches of a twisted oak. Yevetha shivered. Tonight the Great Mother, Giver of Life, returned to the underworld and the Horned One, Lord of the Dead, ruled the earth. Yevetha murmured a prayer to the Great Mother for protection as she began her journey. The moaning voice called to her. She followed it across a meadow of drying clover. Iulani, her daughter, had loved to run through this field as a child. As a young woman she crawled through it to reach Yevetha’s hut. She was two moons from giving birth, bruised from her mate’s beating, and bleeding heavily. Iulani died in her mother’s arms, cursing her mate and the new religion that had turned their love to ashes. Yevetha shook off her reverie and followed the eerie sound through the village. Light flickered through cracks in the other huts as villagers tried to keep out the spirits of the dead with blazing hearth fires. As she approached a blackened stake in the middle of the village, the scars on her back tightened and itched. Twenty years ago, two new priests had arrived in Willow Village, interrupted the women’s planting rites and declared the Sun God supreme over all gods. Yevetha refused to worship the new deity. The priests dragged her through the village by her hair, tied her to a stake and whipped her naked back with aspen canes. Her fading vision had spied Berk emerging from the forest with two rabbits on a thong. He reached her side before she collapsed, grabbed the canes and threatened the priests with his bronze knife. She saw the look of venom on their faces as Berk cut her down and fear crowded out the pain. Later he laughed at her suggestion that two weak priests might be a danger to him. After the first snow, she found his broken body at the bottom of the chalk cliff. The voice became more insistent. Yevetha wiped tears from her eyes and muttered a curse as she approached the priests’ house. It was well thatched and daubed with clay. A warm secure place to keep out the night wind and winter snow. She hurried past before the voice could rouse the priests and followed a path to the peat bog beyond the village. A faint glow hovered above some disturbed ground, the voice lowered to a whisper and a chill settled in Yevetha’s bones. She hesitated for several minutes, praying to the Great Mother to give her strength for what she must do. She started digging, carefully placing the bricks of peat to one side. Two layers below the surface she found Bohumil: hands bound to feet, lying on his side, eyes pinned shut with thorns, throat slit, and chest cracked. The scorched meat of his heart rested in an oak bowl at his feet. The wheel of the Sun God was carved on his forehead. Yevetha slumped to the wet earth, pulling her hair and howling her grief. She felt the ice entombing her heart shatter into a thousand pieces. Each shard slashed her flesh to leave her bleeding inside. Slowly a white-hot rage boiled up from her womb and cauterized the wounds. Yevetha pulled all her strength together, rose to her feet and swore vengeance by the spirits of her dead. When the moon was nearly set, the old woman placed the herbs of passing on the body of her grandson and prayed to the Horned One to release the boy’s spirit from his bonds and guide him to the green fields of the Great Mother. A cold breeze brushed her cheek, freezing her tears as she replaced the peat. The moaning voice died away, but she thought she felt a familiar hand helping her to her feet. A warm kiss brushed her lips and a girl’s bright laughter echoed in the mist. Just one more winter, she sighed, then she could join her dead. Yevetha hobbled back to the village, humming a child’s sleeping song as she gathered plants by the fading light of the bloodshot moon. She picked carefully among the nodding heads of grain. It had been a cool wet summer and the grain was splotchy with black mold. Ritual bread made with moldy rye would give nightmares, spasms and a slow, painful death. By the time the Horned One returned to the underworld in the spring, the Sun priests would be there to greet Him. This time as Yevetha passed the priests’ house she started to laugh. The wild sound rang through the village. She hoped it woke the priests in their sanctuary and sent them shivering under their furs, on this night of the dead. Author’s Note: This story was inspired by the bog bodies found in the UK and Northern Europe. Scientists are still speculating on the individual burials. This is my imagined back story. Enjoy! That was delicious! Thank you! So glad you enjoyed it and thanks for the rec on your blog! You are very welcome..I just wish I was a bigger blog, to shout out more effectively! We have our share of bog bodies in Ireland. Two especially notable examples were discovered in the “noughties”. When I visit the National Museum in Dublins I like to see the exhibits associated with them. I am particularly fascinated by “Old Croghan Man”. There are details about Celtic society preserved in the sagas set down in works such as the Book of Leinster and the Book of Invasions. Examination of the bog bodies has revealed evidence which confirms some of these details and lends them greater significance. One of the bog bodies discovered some years back was that of a young man of high status. Presumably he was considered to be an especially acceptable sacrifice to the gods. Babbling About Books and More!